« MacVector 12.6: Coming soon..
MacVector has a brand new tool for designing primers. QuickTest Primer completely changes the way primers can be designed on a computer. It simplifies primer design by showing your primer and its statistics in realtime. Does your primer have a hairpin? Nudge it along your template until the hairpin goes? Want to add a restriction site? Then add one and again nudge your primer to optimise the oligo. Want to see how a CDS translation is affected by your modified primer? View both the original and modified amino acid sequence. Quicktest Primer can also be used in conjunction with Primer3 to rapidly design pairs of primers with mismatches and/or tails and to generate the predicted product of the reaction, complete with tails and/or mismatches. Annotate the predicted product back to your sequence. Quicktest Primer allows you to quickly evaluate the suitability of any short DNA sequence for use in PCR or sequencing experiments. Simply open Quicktest Primer using Analyze | Primers | Quicktest Primer… and type or paste in a primer sequence to display the primer properties instantly. Alternatively, you can evaluate any short portion of an existing sequence quickly by selecting that portion in the Editor, Map or Features view before starting Quicktest Primer. Quicktest Primer displays a detailed set of properties for a primer sequence and these properties will change in realtime as you modify the primer. For example if you have a hairpin you can nudge your primer along the template until this disappears or if you have added a restriction site you can slide the primer along until it does not change the translation of any CDS feature that your PCR product would contain. QuickTest Primer is linked to the active nucleic acid sequence window. 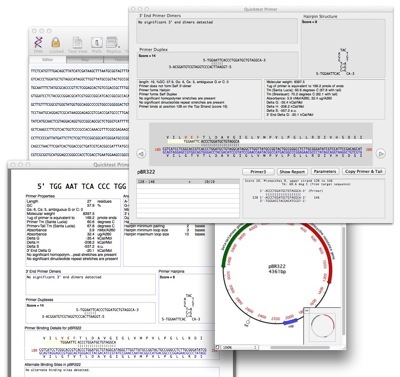 If you select a different nucleic acid sequence window, then MacVector will recalculate the primer properties. Since no binding information is displayed if the selected primer does not bind to the current sequence, you can use this feature to establish quickly if (and where) the primer binds to any open nucleic acid sequences. Presence of “bad” residues like non-G/C 3’ end and runs of >3 homopolymers. Graphical display of hairpin loops and primer dimers. Location of any other matches on the target sequence. Translations of any CDS features that overlap the binding region are also shown. Add a user defined 5’ tail. Nudge the primer along the target sequence to find the optimum sequence. Create a mismatch at any location (especially corresponding to a “one out” site). View secondary structure in real time as you enter a primer sequence. Generate a detailed report of your primer. Slide your oligo along your sequence to find the optimal site. See any changes in the translated protein sequence as you design your primer. Quicktest Primer shares the same reaction conditions as all the other primer/probe tools. So regardless of which tool you use you will see consistent results. This entry was posted in Releases, Techniques and tagged pcr, primer3. Bookmark the permalink. Both comments and trackbacks are currently closed. Follow up. Sorry still waking up. I am actually referring to adding 5′ tags not 3′ as i initially stated in the post. Glad you like this tool. The pasting issue is likely a bug and I’ve entered it into our bug database. So it will be fixed in a future release. Either a minor update or in 12.7 which is in development at the moment. For the second issue you should just be able to treat it as the forward primer. If you enter a reverse primer (i.e. the 5′ to 3′ sequence of the reverse primer on the complementary strand) then the template sequence will be “flipped” automatically so that you can just type/paste the 5′ tag into it. Do I understand your question correctly? It is used for test the prime. it play the important role for testing.QuickTest Primer is linked to the active nucleic acid sequence window. If you select a different nucleic acid sequence window, then MacVector will recalculate the primer properties.Thanks for provide good knowledge.